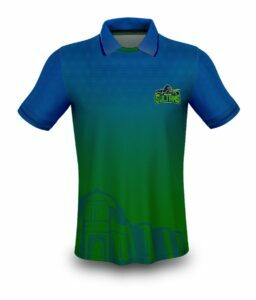 Get Multan Sultans Team Kit, Logo and Official Song for PSL 2019. Pakistan Super League 2019 is being held from 14th February in U.A.E and Pakistan. A total of six teams will participate in it. Multan Sultans represent Multan city which is the largest city in South Punjab. Multan Sultans Team Kit, Logo and official Song is available here. Multan Sultans are the sixth team in Pakistan Super League. The new team from South Punjab contested in the third season of PSL but could not reached to the finals. After the first season Schon Properties from Dubai gave up on the ownership of Multan Sultan. However, Ali Tareen (Son of Jahangir Tareen) bought the ownership rights for Multan Sultans in November. This year Shoaib Malik will be leading the Sultan, whereas the Boom Boom Shahid Afridi will also be playing for Multan Sultan. Mutlan Sultan management has introduced official Team Kit, Logo and Official Song for the PSL 2019. The official Team Kit for Multan Sultans in the PSL 2019 is printed with the ligth blue and light green colors. The top of the team kit is in blue color, where as the bottom is designed with greenish touch. Moreover, the official Multan Sultans Logo is also placed on the top left side of the Team Kit. The official logo for Multan Sultans in PSL 2019 is a warrior riding a horse and charging with a bat towards the opponent teams. Top of this warrior is the Shrine Symbol of Hazrat Shah Rukn e Alam. However, the bottom side of this logo is printed with the Multan Sultan team name. 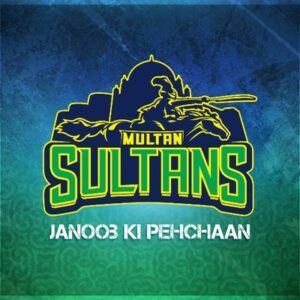 The Official Song Anthem for Multan Sultans in PSL 2019 is ” Multan Sultan, Multan Ke Sultan, Janoob Ki Pehchan”. This song is sung by the Rustam Ali and Zahid Ali. Shoaib Malik(c), Shan Masood, Umar Siddiq, Muhammad Junaid, Junaid Khan, Mohammad Abbas , Shahid Afridi, Qais Ahmad, Laurie Evans, Mohammad Irfan, Mohammad Irfan, Mohammad Ilyas, Nauman Ali, Andre Russell, James Vince, Daniel Christian, Tom Moores, Ali Shafiq, Shakeel Ansar, Hammad Azam, Johnson Charles.